The Umbrella Academy | Blah! Sometimes, stories are interesting just for their weirdness. 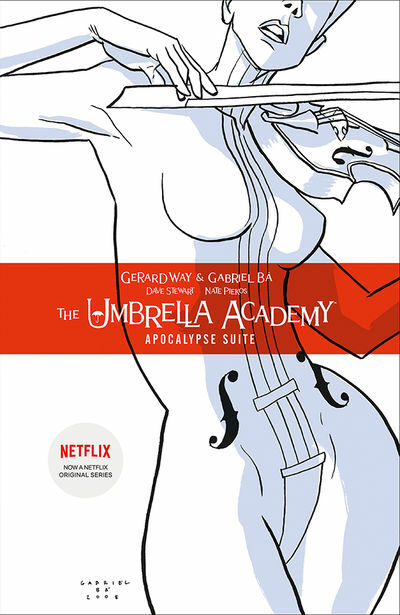 Not to say that is the only thing I liked about Umbrella Academy, but it is definitely the main thing that attracted me to it. The story is about a group of kids, born at the same moment to women who weren’t pregnant. Of the 40+ kids born, only 7 are known to survive, collected by an eminant scientist and raised as his own. It turns out, these kids are special, with very special powers. We don’t learn too much about the kids or the motivations of their “father”. However, ten years later, when the Eiffel Tower is attacking Paris, the kids come to save the city, using their powers to defeat “Robot Zombie Gustav Eiffel”, one of many odd and interesting characters (though we learn next to nothing about him). The main story, however, takes place yet another 20 years later when the kids are reunited after a death in the family. One interesting aspect of the story is that the different characters are never really described. There are hints as to their history and personalities, but there is no exposition on who they are, what their powers are, or what events lead to the current situation, for the most part (there are hints here and there, but they are more dropped than expoused upon). We learn about the characters from their interactions and from their actions, which is an interesting approach. We are just dropped into the middle of their lives. This is very different from the main stream books where every issue we have to have a synopsis of what happened over the last 100 issues. Here, you learn as you go, watching the heroes in real time. One character barely uses her powers at all (it is only in a supplementary story where it was clear what her powers are), and another is mysteriously absent in the final arc of the story. We know something bad happened to him, but what exactly, we never learn. I won’t go into the details of the plot, but it is definitely odd. And involves the desctruction of the world, naturally (as most good comic stories do). But, really, the most interesting thing about the story is not the story itself, but the characters and the world they live in, which is only hinted at. We know, for example, there are Martian Apes, but we don’t know more. We know there are aliens, but we don’t know more. We know that there were 40+ kids born on that fateful day, but we only know about these 7. Are there others? For those wanting a self-contained (6-issue), well-told story, I recommend this. The art fits the story telling nicely, being somewhat cartoony, but that is appropriate in that a realistic style would not capture the utter strangeness of this world.